Cetyl Alcohol, Ceteth-2, Sorbitol Solution, Imidazolidinyl Urea and Purified Water. For the temporary relief of minor aches and pain of muscles and joints associated with arthritis, simple backache, strains and sprains. *Products containing purified capsaicin are most recommended by doctors and pharmacists. Adults and children 2 years of age and older: Apply to affected area not more than 3 to 4 times daily. Children under 2 years of age: consult a physician. A passing burning sensation may occur upon application, but generally disappears in several days. Application schedules of less than 3 to 4 times a day may not provide optimum pain relief ant the burning sensation may persist. WASH HANDS WITH SOAP AND WATER AFTER APPLYING UNLESS TREATING HANDS. For external use only. Avoid contact with eyes and mucus membranes. If conditions worsens, or if symptoms persist for more than 7 days or clear up and occur again within a few days, discontinue use of this product and consult a physician. Do not apply to wounds, damage or broken (open), irritated skin or excessive irritation develops. Do not bandage tightly. Do not use with heating pad. As with any drug, if you are pregnant or nursing a baby, seek the advice of a health professional before using this product. Keep this and all drugs out of the reach of children. In case of accidental ingestion, seek professional assistance or contact a poison control center immediately. Store at room temperature 15-30 degrees C (59-86 degrees F). Lot number and expiration date: See tube seal area or end flap. 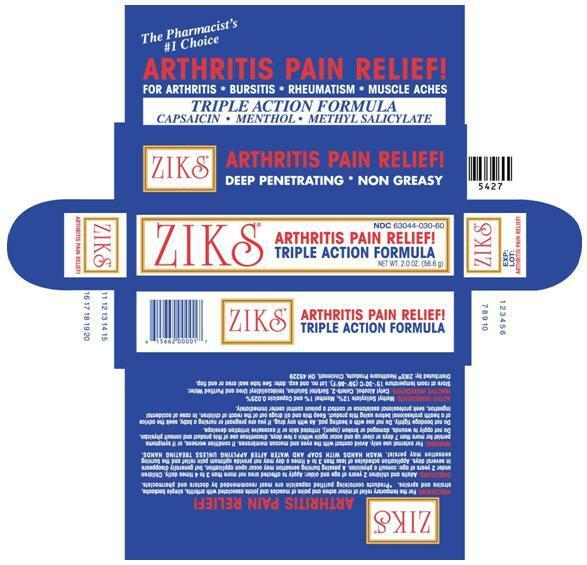 Ziks cream is supplied in a 2 oz. tube.